PASADENA, Calif. - For Michael Clarke Duncan, the Kingpin might end up as the biggest role of his career -- and it has nothing to with the scale of the Daredevil movie. 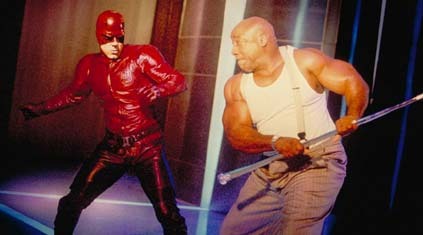 Duncan bulked about 40 points on his already large frame to play the arch-enemy of Daredevil. Duncan met with the press over the weekend at the Daredevil movie junket. During the following roundtable interview, he discussed how difficult it was for an African-American to take a role of a character who was white in the comics, his fight scenes with Ben Affleck and why he thinks there should be a Spider-Man/Daredevil theatrical meeting. QUESTION: You play the Kingpin pretty straight, instead of overplaying it. Was that a conscious decision on your part? MICHAEL CLARKE DUNCAN: That was a very conscious decision on my part. Because I did a television show years ago, a soap opera called The Bold and Beautiful, where I played an inmate, Slash. And every time I looked at the tape, it was worse bit of acting I have ever seen in cinematic history. I mean, I am a big guy. So you don't have to play it big because you're already big. But in that part, I just really played it really over there. And I said, "If I ever get the chance to do that again, I would never do that again." So that was always in my mind, to don't overplay the bigness. You're already big and imposing, you don't have to say it. QUESTION: Part of that is the attitude of the character. He doesn't want any one to know that he's the Kingpin. MICHAEL CLARKE DUNCAN: That's right. He doesn't have to go out and say it and act big. We know that guy's a big, rough character. So he doesn't have to say anything. QUESTION: I loved the way you were laid back when the olive in your martini got pierced (by Bullseye). MICHAEL CLARKE DUNCAN: (Laughs) Well, you know what? Actually, that scene is actually one of my favorite scenes that I worked on because Colin Farrell is so good. He has such a tremendous presence. He has such energy. When he comes out the set, you've got to be ready. Because when he steps on the set, he is ready. He brought me up. But I couldn't get too up because my character isn't really over-the-top. But just watching him do his thing was so much fun. I like working with him. QUESTION: How familiar were you with the comic book? MICHAEL CLARKE DUNCAN: I had the comic books as a child. I had Daredevil, I had Batman and Robin, I had Aquaman, Green Lantern � I had all of them. But what I did � I had like 300 and I kept them on the floor because it was easier to trade that way. When my friends would come over, they would just slap one down and say, "OK, I'm going to take this one," instead of going to get a big pile and having to look through them. But my mother felt that the room just looked horrible. And so one day, when I was in sixth grade, I came in and my room was just clean. And I asked my mother, "What did you do with all those comics?" She said, "You mean all those filthy comic books? I burned them. I threw them in the incinerator." And I'm like, "No!" So today, I have to work for a living instead of being in Jamaica somewhere off the wealth of the comic books. QUESTION: The Kingpin is white in the comics. What do you think when they came to you? MICHAEL CLARKE DUNCAN: Mark Steven Johnson (the director) told me at lunch and I said, "Are you certain that you have all your research? Because I don't want nobody marching outside my trailer. I don't want all this black and white stuff. I want to come to work and not be bothered." I said, "Are you sure you want to go with route?" And he told me that the people at Fox, (New) Regency and himself had complete confidence in me as being the best actor for the job. And once he sold me on that, I never thought about the color thing again. QUESTION: And going back to reading the comic book as a kid, did you ever picture yourself being an actor in being in this kind of movie? MICHAEL CLARKE DUNCAN: No. No, I never thought they would make movies about comic books. I thought it would be cool if they did and I told somebody else that I think one of the coolest movies would be to get Tobey Maguire and Ben Affleck, Daredevil and Spider-Man. But they act like it's such a big deal. "This studio won't talk to this one." I mean, c'mon, we're trying to make a movie. QUESTION: It's done in the comics all in the time. MICHAEL CLARKE DUNCAN: And it's done in the cartoons. I just watched a DVD last night. It would be one of the biggest movies ever. Kingpin is the enemy of both of them. So if the two studios can get together � remember, I said it first. QUESTION: What was it like working with Ben (Affleck)? MICHAEL CLARKE DUNCAN: Any time you work with a friend, it's easy on the set. We teased each other. I teased him about that goofy red outfit he had one. I said, "You know what? I can't see you being this super-hero Daredevil. It's just tripping me out that they chose you as the Daredevil, man." And he said, "Well get used to it because I am the Daredevil." And I said, "Not in my eyesight. Once you put on that little red suit, you look like a pixie, for one. I'm trying to get a hold of that fact right now. Just turning around and seeing him there, you want to laugh at first. Ben Affleck down there, is not the Daredevil. Mark actually pulled me aside and said, "Why are you laughing?" I said, "Man, because that's Ben in the stupid red outfit." And Mark said, "No, that's the Daredevil." And I said, "No, it's not. That's Ben Affleck down there in a stupid red outfit." It took me about 20 minutes before our right scene to get off by myself and say, "Hey, this is a job. That's the Daredevil. That's Matt Murdock." But then, when I finally got into that zone and I'm really into it, I turn around and I say, "Daredevil�" And he goes, "Kingpin�" and he whips his cane out and then his cane breaks apart. And I said, "Now, see, that's Ben right there. Matt Murdock wouldn't let that happen. That's Ben right there. You see, you just wiped it out again!" We had a lot of fun. QUESTION: As an African-American actor, what does it mean to you that they would take a role that was originally written for a white character and allow you to play it? Does it say something greater about Hollywood? MICHAEL CLARKE DUNCAN: I just think it says something about acting ability. Because if they had went with an Asian, if they had went with any other nationality, if that actor can do the job, I think that actor should have the job. I don't you should look at somebody and say, "Only this guy could be a lawyer because he has a lawyer look." And that's a constant battle with me with studios because they'll look at me and say, "I don't think you could be a lawyer." And I say, "Why not? I could be an ex-football player who had his need shattered who took up law." I say, "You could easily get around it." But they just look at me and say, "He's too big to do this. He's too big to do that." That's the only thing I don't like. So, in answer to you question, I think it says about the person and not the color. QUESTION: I understand Ben actually hit you in the eye when you were rehearsing. MICHAEL CLARKE DUNCAN: Yeah, he hit me in the eye with a lead pipe, that little cane thing he had. We were going over the fight scene and I said, "Come over here. Let's talk about this. Let's get the beats down. When I swing this way, you come back and block, then I block" this, that and the other. Then he says, "Yeah, then I come up with the cane." And I said, "Wait a minute." I said, "Don't you want the rubber one?" He said, "Nah. No, no, no, I'm OK, I'm OK."
I said, "Well, are you sure?" And I'm literally going this slow (moving methodically) and he comes up and goes - Wham! - and I'm like, "What did I just say to you?" He goes, "Michael, Michael, I'm so sorry." "You know what?" I said. "We can settle this. Stunt man, come replace Ben right now." And the stunt guy came in and we went all the way through. You had to be careful when you're working with him. QUESTION: How pleased are you with the finished film? MICHAEL CLARKE DUNCAN: I am very pleased with it. I just wished they moved the ending with Bullseye in the hospital. I wish that was up. Because a lot of people leave out when the credits roll. I just happen to be talking and I saw it. I want people to know what happens to this guy. I stay for all the credits because I like to see who was working. But a lot of people, 75 percent of the people get up and leave. QUESTION: After I saw that, I stayed and waited for more, wondering if they were going to show you in prison. MICHAEL CLARKE DUNCAN: We did film that. We filmed the part - and I hope it's on the DVD - where I'm the behind the cell and the camera goes, and Wesley is put in the next cell right beside me. We filmed a scene where Wesley told that I was the Kingpin. And when I find out he's in the cell next to me, I go, "Hello, Wesley. Nice seeing you again." And then it kind of fades out right there. I really wanted to see that in the movie. QUESTION: Do you think this movie is too violent for a young audience? MICHAEL CLARKE DUNCAN: No. You know what? We took out a lot of things. I know I had another scene where I kill two people, two of my own bodyguards, because I thought they were snitching on me. It's the scene where Wesley comes in and says, "Somebody's been talking." And I say, "Someone always does." And I turn to walk, and then it goes to me sitting down at the table with my business partner. And during that scene when I'm walking, there were two bodyguards over to the left. And I say, "You know, Wesley, during Egyptian times they'd cut out the tongue of the bodyguards so they couldn't talk." And at that moment, I pick up my cane and brain one of them, and blood goes flying. The other one, I grab him, snap his neck and he falls. And they just felt, to get a PG rating, it was too violent. So that will probably be on the DVD as well. But no, I didn't think it was too violent. QUESTION: Are you doing the voice of the animated Kingpin? MICHAEL CLARKE DUNCAN: Yes. When they told me and they called me and asked me to do the animated cartoon, I said, "No problem." I couldn't see anybody else doing the Kingpin but me. This is my guy right here. QUESTION: In the comic book, Kingpin always seems the one villain Daredevil can't quite defeat. Do you think you'll be back? But the next time we fight, it'll be a different story. But he cannot beat Kingpin. Nobody can beat Kingpin one-on-one. QUESTION: What is your reaction to NBC coming out with a series with the same name? MICHAEL CLARKE DUNCAN: If you think you can ride somebody's roller coaster, why not get on? And I think they're riding our roller coaster right now. I don't blame them. It kind of confused me. For a minute, I'm like, "Wait a minute, I didn't do that." Then I'm like, "Whoa, that's not me." If that's what they want to do, they're timing is very good. QUESTION: Did you notice a change in production after the success of Spider-Man? MICHAEL CLARKE DUNCAN: No, not really. And I was one of the first guys in the theater to see Spider-Man because that's another big movie for me. I love that character. But, no, I didn't notice any change on the set or anything. Everybody was talking about it. But who in Hollywood wasn't talking about it? I mean, $115 million in one weekend. That's like the bar is way up there. QUESTION: Did they put more money into it? MICHAEL CLARKE DUNCAN: They did put more money into it, yes. I think the budget went from $60 to $80 to $100 million. I think they felt, "Hey, if we're going to do this right, we need to pour some more money into it." Which was a good idea. QUESTION: As a comic-book fan, are there any other characters you would like seen brought to the big screen? MICHAEL CLARKE DUNCAN: Green Lantern. That's another one in the comic books, in some he was white and some he was black. And Aquaman. I'm really interested in seeing how they'll do the Incredible Hulk. Every time I think about Hulk, I think about Lou Ferrigno. That's the only person I see because he just embodied the Hulk. I met him a couple of nights ago at a party, and I just saw Hulk. It's going to be interesting to see how they're going to make the transformation from the guy to the Hulk. It was easier when they had Bill Bixby. You could see him shaking his eyes and turning green and all of a sudden you go to Lou Ferrigno. Bastion and his prime sentinels have devised a way to destroy the mutants once and for all. They've kidnapped Forge to help create the ultimate weapon. Now it's up to the X-Men to smash the scheme before they bite the dust, even if it means teaming with their arch-enemy, The Brotherhood. Features:Destroy your environment as you fight, and use nearby objects to fend off foes. Bring 24 of your favorite X-Men characters to life with incredible graphics and smooth animation. Battle through expansive 3D levels that imitate epic comic and film superhero battles. Enjoy 21 mind-bending, dynamic environments.Experience large-scale close-up combat.